Do you have to get ‘right’ before you will let it go? Those of us plagued by perfectionism find it dogging us everywhere we go and in everything we do – at work or at home. This obsession with excellence steals zest and joy from our day-to-day lives. For example, maybe you get your undies all in a bundle if that new recipe you were so excited about comes out … well not at all how it looked it the photo. So then you have to apologize to everyone the whole time you are serving and eating it. At least with food, we usually follow through to completion. Other types of projects often don’t fare so well. How many exciting ideas have you abandoned once you realized that the result would not not be up to your standards? Although a certain standard of excellence can be a motivation to go the extra mile and perform or produce even better than last time, the problem with too high a standard is—you just don’t produce it at all. Or, your accomplishment or performance, while excellent, has left you depleted and longing for something more. I’m the poster child for both. My own perfectionism has often garnered me approval and even awards for high achievement. This looked good on the outside—but came at a cost. For example, when I returned to University in my 40’s nothing would do but straight A’s. Which I got, along with several awards, when I graduated with a double major and 4.0 average. And—I spent hundreds of hours obsessively studying, over-researching, and writing papers. I passed up invitations to hike in the redwoods with dear friends, or enjoy a movie and a snuggle with my daughters. I crawled into bed long after my husband had fallen asleep. I drank way too much coffee chased by scones and muffins, and my face and waistline showed it. Not only that, I dropped out of, or declined to take fascinating classes when I thought there was a chance I might not be able to get that coveted A. And for what? That 4.0 instead of a 3.5. Now, several years later, I’d laugh if I wasn’t cringing so hard because what difference does it really make? When we are attached to a ‘perfect’ outcome we often decide not to do it at all. Perfectionism and procrastination are evil twins. Perfectionism has a few more evil siblings. It’s intimately related to both Anxiety and Depression. It is also kissing cousins with Worry. Despite what many of us were taught in school, “getting it perfect” is not such a worthy goal after all. I am now on a mission to leave the perfectionism in the dust, and to put myself out there in world. That’s what I did this past month with my ‘write a blog post every week day’ challenge. If felt great to just write those blogs and release them to you. There wasn’t time to get all perfectionist about them because I had to hit publish every single weekday. 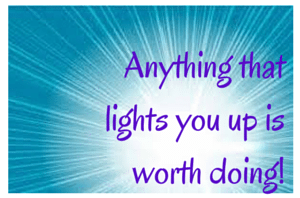 Anything that lights you up is worth doing. It’s worth doing if its calling to you. It’s worth doing even if you bumble and stumble and fall. If you’re also ‘in recovery’ from perfectionism, take a deep breath. Accept that like an alcoholic, you will always be tempted to hold out for perfect. Letting go of perfectionism requires a willingness to be vulnerable. It’s scary stuff. It means noticing those mean things your inner perfectionist is saying inside your head, and realizing that this this not the voice of Truth. And it means consciously choosing different thoughts. How does perfectionism hold YOU back? Are you willing to take one small step that is ‘perfectly imperfect’? Share it in the comments below! It always amazes me how perfectionism is worn like a badge, but it’s really a burden. And I completely agree with you on that silly saying about things worth doing are worth “doing right”. It’s BS. I has stopped me for decades. Our best at present, that is all. I found you because I was looking for a nice Autumn Equinox ritual for a women’s group I lead and somehow landed here. I am no convert to “woo-woo” either which is maybe why I am just now hearing this term and honestly, not liking it. It is dismissive instead of inquiring. But I understand, as I am a skeptic as well and I don’t expect people to believe anything. 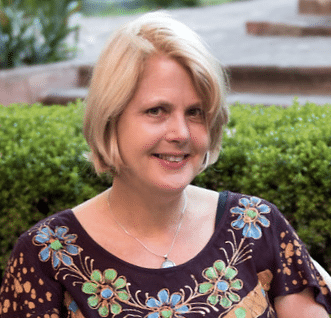 Hi Gabrielle – delighted to ‘meet’ you here on the blog! A fellow member of the Team! And how amazing that you mention that particular book! It was that that book, Finding Your Way in a Wild New World, and especially that section on spoon bending that propelled me on my journey toward becoming a Martha Beck coach! I have now bent my own spoon which I keep on my altar… but it doesn’t play with me every time I try! So glad you discovered the Equinox rituals. Happy Equinox! Time to celebrate in all of our gloriously imperfect wholeness!